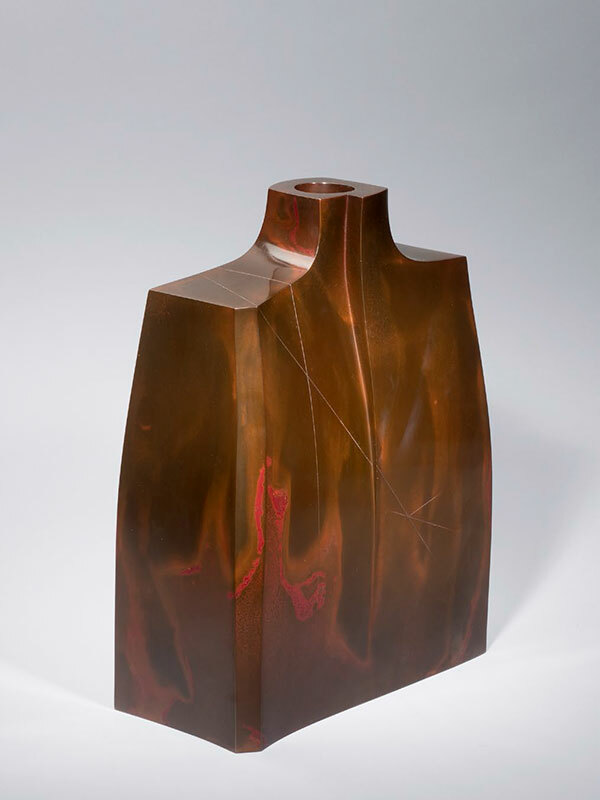 A large bronze vase of bottle shape and rectangular outline. The front is cast in two ‘overlapping’ sections and engraved with fine lines. The patina is brown with characteristic red patches all over. Signed on the base: Shugoro. With the original wood tomobako, inscribed on the lid and signed on the reverse: Shugoro with the seal Shugoro. Hasudo Shugoro (1915-2010) (given name Shoji) was born in Kanazawa city, Ishikawa Prefecture. He studied under Takamura Toyochika (1890-1972) in metal craft and Kato Kensei (1894-1966) in metal sculpture. The year before his graduation, in 1937, he won at the Real Craft Exhibition [Jitsuzai Kogei]. He set up the R Art Crafts Group [R Kogei shudan] in 1948 and the Creative Art Crafts Association [Sosaku kogei kyokai] in 1954. He was awarded for the first time at the 1949 Nitten exhibition. In 1961 he was awarded the Japan Art Academy award at the 4th New Nitten exhibition. Later he served as jury and committee member of the Nitten exhibitions. In 1950 he joined the Association of Metal Cast artists [Chukinka kyokai]. In 1960 he joined in The Subject, a metal cast group chaired by Takamura Toyochika. In the same year Shoguro set up Enshin [The Heart of the Circle], an art crafts group. In the following year, he founded the Modern Art and Crafts Artists Association [Gendai kogei bijutsuka kyokai]. In 1961 he was appointed Assistant Professor at the Tokyo University of Fine Arts, where he became Professor in 1975, and Emeritus Professor in 1986. He received the Medal of Honour with Dark Blue Ribbon from the Japanese Government [Konju hosho]. He set up the Research Centre of Japan Metal Sculpting [Nihon kinzoku zokei kenkyusho], and was made President of the Centre of Promotion of Japan Metal Sculpting [Zaidan hojin Nihon kinzoku zokei shinkukai]. In 1987 he was honoured as a Person of Cultural Merit by the Japanese government [Bunka korosha-sho].